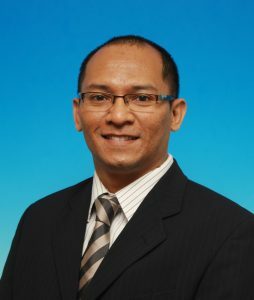 Prof. Rafiq received his PhD from the Optoelectronics Research Centre, University of Southampton in 2007, specialising in glass-based integrated optical devices for use in telecommunication and sensing applications. In 2013, Prof. Rafiq was promoted as a full professor. He has published more than 100 peer-reviewed journal and conference papers on optics and engineering education. His Integrated Lightwave Research Group – which he started – currently runs an optical fibre fabrication tower. His Flat Fibre patent was the winner of the Gold Award, The Best for Physical Sciences and Engineering, and The Best of the Best (Top Prize) during University of Malaya Research, Invention and Innovation Expo 2009 (UM EKSPO 2009). His research work on corrosion sensing appeared in the March 2013 issue of a reputable international technical magazine called Optics and Photonics News. His group also picked up the top prize – Malaysia Science Academy’s Innovation Award during the 5th Exposition on Islamic Innovation i-INOVA 2014. His group’s collaborative research on dengue detection with the University of Ottawa was featured in reputable high impact journals and media, including Nature, Science, and Laser Focus World. Prof Rafiq was awarded the Malaysia Toray Science Foundation Science and Technology Award in 2017 as recognition for his contributions to the field of photonics. Prof. Faisal Rafiq Mahamd Adikan is currently serving his second term as University of Malaya’s Deputy Vice Chancellor of Development. His first term was from 2013 to 2016. Prof. Rafiq has served in numerous national level committees, including that of the Economic Planning Unit (EPU). He has been a speaker and panelist in numerous platforms, including those organized by Higher Learning Leadership Academy (Akademi Kepimpinan Pendidikan Tinggi, AKepT) under the Ministry of Higher Education (MoHE). He is also a reviewer to several international journals which include IEEE Photonics Journal and the Journal of Lightwave Technology. In October 2015, Prof. Rafiq was appointed as Executive Director of UM Holdings Sdn Bhd – University of Malaya’s business and investment arm, making him UM Holding’s first Executive Director (while still holding a Deputy Vice-Chancellor position). The spin off company he founded in 2015, Flexilicate Sdn Bhd, was the Best ASEAN University Startup during the inaugural Rice Bowl Startup Awards 2015. Flexilicate, which means flexible silicate (or glass), markets fibre fabrication services, micro-capillaries and fibre based dosimeters. In June 2016, Flexilicate and its collaborator – the University of Southampton – won the prestigious Dengue Tech Challenge grant amounting to RM1.9mil. The grant supports collaborative projects that bring together experts from Malaysia and the United Kingdom and was jointly organized and supported by Newton-Ungku Omar Fund, British Council, PlatCOM Ventures Sdn. Bhd., SME Corp and Malaysia Innovation Agency (Agensi Inovasi Malaysia). Prof. Rafiq was the recipient of the Section Prize for the Best Engineering Research during Presentations at the House of Commons (British Parliament) in 2006 and the Best Paper for Photonic Category during an international conference in 2003. His PhD work on Flat Fibres produced an international patent. He was the Best Lecturer for the Sciences Category in 2009 and 2012 during University of Malaya’s Excellence Awards. He also received an award for Best in Teaching during University of Malaya’s Excellence Awards 2011. In 2013, he picked up University of Malaya’s Best Administrator (Dean) award for a second consecutive year. He has received the Excellence in Services award and certificate numerous times, the latest was in 2016. He received the University of Malaya Sports Icon Award in 2015 for his contribution in upgrading the University’s sport​s facilities and his role in encouraging better sportsmanship. He also received the Best in Commercialisation during UM Excellence Awards 2016.